Many types of institutional and research repositories exist to address different institutional needs, digital collections and research outputs. In this webinar, the presenters will discuss the approaches their institutions have taken, their mandates, software and systems, and staffing. They will also look at the relationships involved: between the library and research office, institutions and publishers, and repository staff and authors. One of the longest standing areas of interest in the US Faculty Survey is in understanding how the role of the library has evolved and continues to evolve over time. Questions on this topic cover how the library is valued and perceived by faculty, how faculty are using the library, perceptions of the importance of collections and other service-related functions of the library, as well as the library’s perceived support to students within one’s institution. In this instructional webinar, you’ll learn more about the COUNTER Code of Practice Release 5 (COP5), which goes into effect in January 2019. Lorraine Estelle, COUNTER Project Director, will highlight key points in the development of the new release, touching on metric types and new reports. Then Elena Zapryanova-Hadjinikolova, COUNTER Executive Committee and Director Analytics, Elsevier, will take you step-by-step through the new reports and familiarize you with their use cases. If you cannot attend the live webinar, be sure to register so that you will have access to the recorded webinar to view at your convenience and share with your colleagues. In this webinar librarians will illustrate how they are helping to develop research ecosystems and services, and apply tools and training for open science. Discover lessons learned from an Open Educational Resources (OER) pilot project and the development of an open access journals program at a university. Find out how another library introduced a culture of open science as they outline best practices around the development of their university’s research support and open science services. Lastly explore open science in terms of cross-sector collaboration from persistent identifiers to standard file formats and vocabularies. They will discuss how it is important to measure and communicate the impact of library resources in terms of value of investment (VOI) rather than just return on investment (ROI). They will show examples of how to work with individual researchers and departments to spotlight their efforts and initiatives via better understanding, assessment, visualization and reporting of impactful outcomes of research and clinical care. And they will show how institutions can come together to pool data and share a powerful report on the impact of library instruction on student retention and academic success. Join our presenters as they share their experiences and best practices for implementing research data management (RDM) solutions on campus and discuss examples of workflows that have enhanced reproducibility. This webinar is based on a workshop the presenters participated in at this year's Research Data Access & Preservation Summit. They will share what works, where in the workflow to best approach stakeholders, how to achieve optimum uptake and researcher engagement, and how to handle or treat situations where intellectual property (IP) or data sensitivity issues arise. 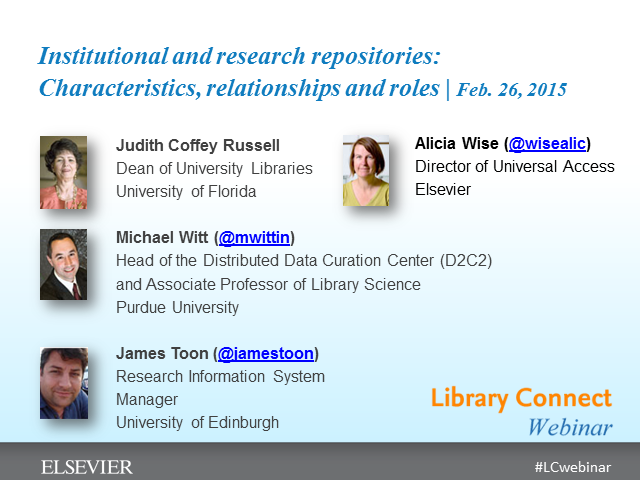 They will discuss best practices for dataset curation and ways libraries can facilitate data sharing. Are you interested in exploring how you might work with faculty one-to-one on enriching their profiles? Learn how one librarian is establishing new services by incorporating a variety of author-level metrics into the university’s ecosystem. Or are you interested in expanding the scope of research outputs shared? See how an escholarship librarian is working with faculty to share their data in its many forms. Finally, get an enterprise-level perspective on repurposing institutional data on research outputs to inform external communications and internal reporting. Discover how librarians are enriching their reports and presentations to key library stakeholders with multimedia and data visualizations. Get ideas on how to give library users a platform to tell their stories about the library. Learn more about tools that can help you gain insight into and share information about your institution's research activities and performance. Registration is required for this live webinar. It will be broadcast internationally and includes time to ask the presenters questions during the session. The webinar is a complimentary event and part of Elsevier's Library Connect program for academic, medical, corporate and government librarians. Cannot attend on November 16? Register for the webinar and you will be notified when it can be viewed online after the event. Join us for an overview of a complimentary analytics dashboard available to you as a librarian whose institution subscribes to Elsevier products and tools. Elsevier Product Insights for Customers (E-PIC) offers a unique view of your institution's engagement with Elsevier's research content and tools. These insights on product usage and your researchers’ collaboration and impact can help inform your library decision making and enhance messaging to your library stakeholders. Find out why librarians using the E-PIC dashboard describe it as a one-stop shop for analysis, user-friendly and highly visual. The webinar presenters will provide an overview of APIs (application programming interfaces - see definition below) and a broad look at various use cases within the library from updating library systems to conducting research or facilitating access for other researchers. Specific use cases include using an API for text mining (clinical applications) and using APIs to update an institutional repository. The webinar is meant for librarians who do not currently have a strong technical background, but who want to familiarize themselves with the technology and its applications. "What if researchers — particularly those new to certain disciplines or to research itself — could have a Wikipedia-like experience that was streamlined and trusted?" This is the question that led two neuroscientists on a fascinating journey to improve literature search, from exploring users' needs to applying cutting edge technologies. Students in an introductory and a higher-level class were assessed to determine where they were doing their research, their comfort level with reading reviews and primary literature, how frequently they came across unfamiliar terms, and how they handled cases where they needed additional clarity. Then they were provided the beta version of ScienceDirect Topics, an enhancement to the database that provides links within journal articles to 80,000+ topic pages with citable and trusted definitions that are contextualized within a discipline. Did it make a difference? Find out by attending the Library Connect webinar: Literature search on a connected path. Registration is required for this live one-hour webinar. It will be broadcast internationally and includes time to ask the presenters questions during the session. The webinar is a complimentary event and part of Elsevier's Library Connect program for academic, medical, corporate and government librarians. Cannot attend on Sept 29? Register for the webinar and you will be notified when it can be viewed online after the event. Today’s researchers are obliged to include a variety of metrics in their applications for grant funding, and promotion and tenure files. They also develop online profiles to enhance their reputation and attract collaborators. Whether welcome or worrisome, researcher profiles and metrics have become commonplace. So how can librarians help? It begins with a conversation. Discover how to put researchers at ease with the notion of metrics, and what metrics can and cannot convey. Find out more about how to select the best metrics for different disciplines and at different stages of the research career. And learn how institutional initiatives, such as instituting the ORCID researcher iD and providing early education, can provide them with lifelong benefits. By helping to clarify and codify certain processes, you will ensure your researchers are their own best advocates. In this webinar librarians share their inspiration and process for developing high-impact library services. The head of research and instructional services at a university library will discuss how she and her team are aligning library instruction with high-impact educational practices to increase engagement and retention. The head of a medical library serving a spectrum of healthcare professionals will describe the development and evolution of a systematic review service. And a law librarian shares how he helps faculty increase productivity and get published faster using an open access repository of abstracts and preprints/working papers. As a librarian, you want to introduce your early career researchers to processes and tools that will save them time, improve their workflows, and set them up as good contributors to the scholarly ecosystem. But it can be difficult to keep up-to-date yourself with features across multiple products that address different needs. That’s why we thought we’d try something a little different in our first Library Connect webinar of the year. We’ve asked a PhD candidate and some of our product whizzes to give you a quick review of features in Mendeley, Scopus, ScienceDirect and Hivebench that can help your researchers work smart, work together and stay up-to-date. The era of e-science demands new skill sets and competencies of researchers to ensure their work is accessible, discoverable and reusable. Librarians are naturally positioned to assist in this education as part of their liaison and information literacy services. In this webinar gain a broad understanding of the open research data management ecosystem and initiatives underway. Our presenters will explore data information literacy needs and competencies identified for grad students and researchers, as well as a curriculum developed by the IMLS-funded Data Information Literacy research project. They will discuss how data labs can serve as a physical and social environment – and interdisciplinary platform – for supporting data literacy education. Learn more about how libraries are expanding the scope of information literacy to include open data and related tools, methods and skills. Be informed of projects and models to store, share and cite data, and provide credit for data sharing. In this webinar, two librarians and a faculty expert in the area of impact will discuss specific examples and steps librarians can take to have a significant and recognizable contribution within the research lifecycle. As a librarian, by applying your specialized knowledge and skills to critical steps in the research lifecycle you create new value and a work paradigm as a partner in the process. How do you ensure your information literacy training is compelling and covering the right material? In this webinar, three librarians will discuss interesting ways to enhance your information literacy instruction in the classroom and beyond, including addressing complex topics such copyright education and discipline-specific information sources. Ulla de Stricker shares tips and recommendations to inform the work information managers need to do in telling their value stories. Moving beyond usage statistics, Ulla will demonstrate how impact measurement is key to making the business case why it’s worth paying for Information Management services. Impact analysis in turn requires understanding of stakeholder groups’ projects and priorities. Strategic planning is required to maximize positive influence on business outcomes, and communication skills are essential in getting the word out. Come away from the webinar with insights you can put to use immediately to prove the value of information managers. Do you know what the h-index is, but wonder how it varies among disciplines? Are you curious about metrics beyond the Impact Factor to assess journal quality? In this webinar, discover a basket of metrics you can use to look at author, article and journal impact. Find out the actual formulas for these metrics and tools for calculation or reliable sources. Also, discover how to put the metrics in context when it comes to a particular discipline or career stage. Find out why this maxim is only part of the solution when it comes to library spaces and services. Researchers and faculty do not have to leave their labs or offices to access the information they need to do their work. How then do you – as their librarian – connect with this critical user group? And how do libraries ensure that their research community is making the most of the resources available to them? In this webinar three experienced librarians, who are leading major initiatives within their universities, will discuss getting to know their research communities and outreach activities to engage various user groups. They will explore how services and a physical space, like a Research Commons within the library, can enhance collaboration, interdisciplinarity and raise the profile of the library. However, “if you build it, they will come” is just part of a broader outlook. Find out why it’s important to venture beyond the library to become a true partner in the academic life and research mission of your institution. In this webinar, three members of the Beyond Downloads project team will discuss the results of interviews, focus groups, and an international survey with more than 1,000 scholars to investigate the ways in which they now access, store, share and use downloaded scholarly articles. By identifying and measuring what traditional metrics fail to examine, the Beyond Downloads project attempts to capture a more complete picture of the use and value of scholarly articles, which is critical for librarians to understand in acquiring, designing and developing library resources and services. Library Connect webinars feature library professionals, researchers and product experts. In the series, they discuss best practices, professional experiences, and new trends and topics within library and information science.